President Obama had some kind words for the Tea Party movement today, saying it fits in America’s “noble tradition of being healthily skeptical about government…" Then he followed the compliment up by insulting the intelligence of every Tea Party member. President Obama said today that members of the Tea Party movement are “misidentifying… who the culprits are” in blaming Democrats for the nation’s deficits and debt. President Obama blamed former President Bush for his deficits. Unfortunately for President Obama, Tea Party members can read a chart. 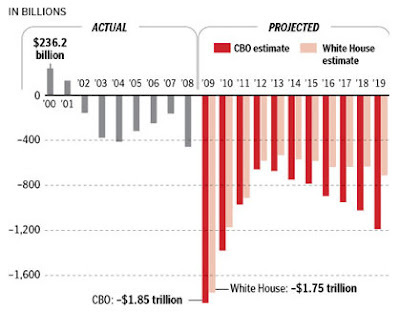 Bush deficits vs Obama deficits.